Southport, NC, a quaint town filled with historic homes, is located at the confluence of the Atlantic Ocean, the Cape Fear River and the Intracoastal Waterway. If you saw the movie, Safe Haven, then you got a taste of the natural beauty that abounds in Southport, NC and its environs. Of course, it’s even better when experienced up close and personal. Whether you arrive by the Southport-Fort Fisher Ferry, located at the east end of town, or drive into town from the north end, you may want to start your visit at the water. From Waterfront Park you can see Battery Island, a protected island and nesting area for the Ibis. These birds are distinguished when flying by their curved bills and the large black spot at the end of each wing. You will also see the Bald Head Island Lighthouse downriver toward the Atlantic and the Oak Island Lighthouse across the Intracoastal Waterway. You are very likely to find men, women and children fishing from the city dock; sailboats tacking the waters; and you may even see the Bald Head Island Ferry heading out with its boatload of passengers. If you cruise west on Bay Street you will come to the Old Yacht Basin with its line-up of shrimp boats and sailing vessels. Along the shore of the yacht basin you will find some wonderful restaurants like the Yacht Basin Provision Company and Fishy Fishy. You can eat either inside or outside while you enjoy your meal, watch the boats go by and take in the scenery. These restaurants serve locally caught seafood and fish as well as chicken, beef and pasta. You can see some of the most amazing sunsets from any seat. Southport, NC began as a fishing village and for many years it was sustained by the menhaden fishing industry. There are still a few men alive who used to sing sea chantys as they plied the water with their nets. The NC Maritime Museum on Davis Street is a great place to learn about the maritime history including the pirate history. Fish still abound here and every year, in the month of October, when the U.S. Open King Mackerel Tournament is held here, the town overflows with fisherman, fishing boats, food and entertainment. This is only one of many fishing tournaments held in the area. Downtown Southport, NC has a vibrant shopping area which is especially known for its antique shops. Moore Street is known as the ‘Antiques District’ as most of the shops that line the street are antique shops. Northrup Antiques Mall, located here, includes a number of dealers in its two stories of antiques and collectibles. You may find everything from the piece you need to complete your grandma’s set of Depression Glass dishes to old tin mechanical toys. Interspersed among the antique shops you will find the office of the State Port Pilot, the local newspaper, and Thai Peppers and The Pharmacy, both excellent restaurants for lunch or dinner. You will find many locally owned shops including a couple of wine shops, a jewelry store, more restaurants and Bull Frog Corner on intersecting Howe Street. There are many artists in Southport, NC as well, as evidenced by the growing number of art galleries. Most of these are located on Howe Street. Franklin Square Gallery, however, is located on E. West Street, behind Franklin Square Park which is on Howe Street. This gallery has been in existence since 1979, but the building that houses it is more than 100 years old, began as a school, and has an interesting and varied history. The gallery is run by the Associated Artists of Southport, a non-profit association, and showcases paintings and pottery by local artists. You can take art classes here as well. Newer art galleries and shops are located in the up and coming ‘Water Tower District’, also on Howe Street. At Howe Outrageous Art Gallery & Marketplace you will find an eclectic mix of art and jewelry hand made by local and regional artists as well as coffee and other edibles. Southport is filled with historic homes that have been beautifully restored as private residences, Inns and Bed & Breakfasts. On W. Bay Street you will find Lois Jane’s Riverview Inn and on E. Bay Street, The Brunswick Inn, which has a fascinating history as well as a resident ghost. The Robert Ruark Bed & Breakfast, located on N. Lord Street is the former home of writer Robert Ruark’s grandfather with whom he spent a lot of time when he was growing up. This experience was detailed in his book, The Old Man and the Boy, an interesting and loving account of life in the Southport of years gone by. The Southport Inn on N. Davis Street is the former home of a sea captain. If you are a movie buff you may remember a movie called Crimes of the Heart, which was filmed in Southport, NC. The home, with its lovely gazebo which was used in that movie, is locally known as the “Crimes of the Heart House” and is located on Caswell Avenue. This is one example of the elegant Victorian homes you will find on each of the live oak lined streets in the downtown area of Southport. On Bay Street you will see an historic home with a widow’s walk which can be seen from the water. You will also find the sea captain’s home that was used in the Safe Haven film located next to the Old Yacht Basin. When you reach Rhett Street, you can stroll through the grounds of the Old Smithville Burial Ground which dates to 1804. On the old tombstones among the sheltering live oak trees you will see names that still exist among the present day populace of Southport, NC. Many of the graves harbor river pilots, sea captains and seamen. Across the street is the Old Brunswick Jail. It must have been disconcerting, to say the least, to look out of the jail window and have the burial ground as your view. Tours of the jail can be arranged through the Southport Historical Society. Katie, of the Old South Tour Company and Carriage Company, will be happy to take you on a candlelight ghost tour, including the cemetery. Just meet her at the Whittler’s Bench at the foot of Howe Street. Southport, NC is known as the Fourth of July Capital of North Carolina. The Fourth of July here is celebrated with a three day festival that closes the downtown streets to vehicular traffic. 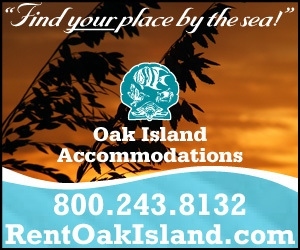 The festival is kicked off with Beach Day on Oak Island and includes a parade, arts and crafts in Franklin Square Park located at the intersection of Howe Street and W. West Street, fireman’s games, music, dancing, concerts, a naturalization ceremony and, of course, fireworks over the water. To get to Oak Island, NC from Southport, NC you need only follow Howe Street north out of town until you come to the intersection of route 211 and 133. Take a left turn onto 133 and continue until you cross the Barbee Bridge across the Intracoastal Waterway and you are there. At the traffic light if you continue going straight you will reach Caswell Beach, NC and if you turn right you will be in the Town of Oak Island, NC. Continue to the east end of Caswell Beach, NC and you will enter the North Carolina Baptist Assembly where you can tour Fort Caswell, a military stronghold that dates from 1827. Don’t be surprised to find neither a timber-built nor a stone fort, but rather, an earthen fort composed of a series of mounds. These mounds served to absorb the shock of heavy explosives while keeping occupants safe from harm. As you head west again, you will pass the US Coast Guard Station at 300A Caswell Beach Road and just beyond that, at 1100 Caswell Beach Road, you will come upon the Oak Island Lighthouse. Because this lighthouse does not contain a spiral staircase but has a series of ships ladders totaling 131 steps, if you want to climb to the top, you will need to schedule a tour in advance as the tour is guided. Parking is available for 30 minutes. The lighthouse was decommissioned and gifted to the Town of Caswell Beach by the federal government as part of the land to parks program in 2004. Beachfront property was included in the gift and a beach access including an observation platform was built. Because there are no cross streets in Caswell Beach, NC the only other beach access is a public access which includes a parking lot. As you continue west again from the lighthouse you will come to the traffic light. A left turn will take you into the Town of Oak Island, NC. Though there are some dead ends, most streets intersecting with Oak Island Drive will take you to a beach access. Though all 65 beach accesses have parking available, some are designated for residents only so as a visitor you will want to avoid parking there. The miles of beaches lend themselves to swimming, basking, playing in the sand, volleyball, bocce ball, surfing, surf fishing, sea kayaking – all the things you love to do at the beach. Access to the Intracoastal Waterway and the Davis Canal provide for additional water sports including kayaking, boating and in-shore fishing. There are two fishing piers on Oak Island, NC - The Oak Island Pier (owned by the town) and the Ocean Crest Pier. The Oak Island Pier is located toward the east end of town at 705 Ocean Drive. You can eat in The Flying Fish, an excellent restaurant located adjacent to the pier. Ocean Crest Pier, located at about the middle of the length of the island at 1411 E. Beach Drive, is flanked by the Ocean Crest Motel on the east side and the Island Way Restaurant on the west side. Both piers host a number of fishing tournaments throughout the fishing season. Both have bait/tackle/gift shops and blanket licenses which preclude you from having to purchase one of your own. Downtown Oak Island, NC offers a Food Lion grocery store, a jewelry store, a number of thrift shops, a post office, retaurants, delis, and ice cream shops as well as a tourist experience with a miniature golf course and small locally owned shops offering beach supplies and knick knacks as well as a couple of large shops like Eagles on Oak Island Drive. Four miles out to sea from Southport is Bald Head Island, NC, an ecological paradise reachable by boat or via the Bald Head Island Ferry which you will find east of Southport at Deep Point Marina, 1301 Ferry Road. There are no cars allowed on the island. The Ferry will deposit you at the Bald Head Island Marina from which you can walk or rent a bicycle or a golf cart with which to transport yourself around the island. Within walking distance is Mojo’s on the Harbor where you can have lunch, if you like. Mojo’s even has a gluten-free menu for those with dietary issues. Some shops, such as Island Passage/Riverside Adventure Company, are also located on the harbor, others are within walking distance. You can also walk to Old Baldy, the oldest standing lighthouse in North Carolina, the Smith Island Museum and the lovely Village Chapel, all located on Lighthouse Wynd. You may want to consider taking the Bald Head Island Historic Tour offered by the Smith Island Museum. This is a guided tour and you will be met at the boat by a tram which will take you all around the island where you will enjoy the historical past including the pirate history, the present, and get an insider's peek at life on Bald Head Island. You will explore the river, beach, marsh and maritime forest. You will tour Old Baldy, visit the museum and lunch at Mojo's on the Harbor. On your own it is probably better to rent a golf cart for transport to any of the 14 miles of beaches, not only because of distance, but also because of the gear you will have to lug with you. You will need a cart or bicycle, as well, to visit the Bald Head Island Conservancy which is located on Federal Road on the other side of the island. The conservancy takes an active part in protecting the island's flora and fauna, including the loggerhead sea turtles that lay their eggs on the beaches every year. You can shop for gifts and turtle related items at Turtle Central, located on the conservancy campus. All profits go to the maintenance of the conservancy and its programs. You can also visit the nature center located on campus where the focus is on wildlife indigenous to Bald Head Island and includes a sea turtle informational exhibit, a sea shell exhibit and seasonal exhibits which feature wildlife. The Sea Turtle Program protects and monitors turtle nesting on Bald Head Island which historically accounts for 50 percent of all sea turtle eggs laid in North Carolina. The conservancy offers nature tours as well. Because Bald Head Island is comprised of 2,000 acres of high land surrounded by 12,000 acres of salt marshes, maritime forest preserve and tidal creeks, paddleboarding and kayaking are popular here. You can rent these items at shops like Coastal Urge on Maritime Way and Island Passage/The Sail Shop on Keelson Row. Playing golf at The Bald Head Island Club is quite popular as well. You can bring your own golf gear with you on the ferry, however, there is a great pro shop where you can purchase or rent your golfing needs. Private and group instruction is available as well and all golf carts include a cooler. The club also includes three separate dining areas for your pleasure at lunch or dinner. The arts are alive and well on Bald Head Island, NC too. You can browse paintings, pottery, sculpture and wood furniture at The Woods Gallery on Maritime Way; attend a meet the artist event; participate in classes, workshops and retreats and shop the twice yearly art shows held at the Bald Head Island Association Center on Lighthouse Wynd. The Woods Gallery is the home of the No Boundaries International Art Colony where artists from all over the globe can work together making art and exchanging ideas in a place of free expression.